My Take on it – This is really a very mediocre murder mystery that only received all the attention it got due to the racial tension that resonates throughout. I wasn’t born yet in 1967, but I can only imagine what kind of controversy this movie brought with it when it came out. Racism in the south was still rampant even though the US Civil War had ended 100 years earlier. The fact that a black police officer would be a part of, or let alone lead an investigation in that area at that time was something completely unheard of. Rod Steiger was solid as the racist police chief who must learn to overcome his bigotry to help solve a murder and deservingly won best actor for it. 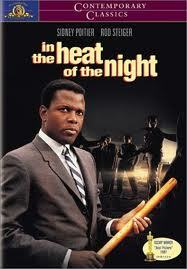 Sidney Poitier was also solid, but since the race barrier at the Oscars was barely broken, he didn’t even get a nomination. Poitier won best actor 4 years prior for Lillies in the Field (1963). Ironically, the barrier was finally broken in 2002 partially by Poitier himself. He received an honorary Oscar in the same year that Denzel Washington won Best Actor for Training Day (2002) and Halle Berry won best actress for Monster’s Ball (2002). This movie’s controversial theme garnered 5 out of 7 Oscars (Picture, Actor – Steiger, Film editing, sound, and Screenplay based on another source) and missed out on Director and Sound effects. Looking at the other 4 BP nominees, it seemed to be a shoe-in since all the others [The Graduate (1967), Bonnie and Clyde (1967), Doctor Doolittle (1967) and Guess Who’s Coming to Dinner (1967) (which I think is the best of the bunch)] aren’t BP Oscar calibers either. In other words, 1967 wasn’t a high quality year for movies and somehow this above average movie was able to run away with these awards. Bottom Line – Mediocre best picture, mediocre murder mystery but the themes make it worth watching. Recommended.